Argentina is the eighth largest country in the world, covering the majority of southern South America. Gaining independence from Spain in 1816, Argentina became the richest South American nation in the early twentieth century, attracting almost six million European immigrants by 1914. Ever-present throughout these cultural shifts, though, have been the Argentine passions for tango, gaucho, football and beef, which have continued to lure visitors from the world over. Beyond the fascinating human geography lies a breathtakingly varied physical version, containing almost every landscape you can imagine. The sub-tropical north spans all the way down through a temperate central region, to a polar southern tip, bringing with it a huge variety of natural wonders and striking backdrops. The best of which include the Andes Mountains along the west, reaching the second highest point on earth, after the Himalayas; the incredible Iguazu Falls, bordering Brazil; the Andean salt flats and glistening glaciers in the Patagonia region. Buenos Aires, the sprawling, cosmopolitan capital, stands at the western shores of the Rio de la Plata. A multicultural city, the majority of architecture is European in style, but Latin at heart, culminating in a dynamic range of picturesque structures. Despite the diversity of the culinary scene, what brings most to Buenos Aires are the superbly grilled steaks, best enjoyed while watching an even better rendition of the tango dance, arguably the nation’s biggest contribution to the world. Add to this a hip arts scene, with detailed murals around every corner in the traditional neighbourhoods, and you have one of the most captivating metropolises on the continent. Within the mountainous northwest region, Salta was founded in 1582, offering a slower pace of life, and more fascinating museums, than the buzzing capital. 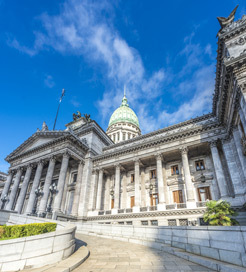 With an aesthetic consisting of well-preserved colonial architecture, more than most Argentinian cities, in fact, it has become one of the most toured areas in the country. It’s also a great hub for exploring the sweeping foot hills nearby. To the east of Argentina is Uruguay, on the opposite side of the Rio de la Plata, across which numerous ferries make international crossings to Buenos Aires. Sailings can last just over an hour, or almost five, depending on your choice of company and departure point: Colonia del Sacramento or the Uruguayan capital, Montevideo. For more information, please visit our Ferries from Uruguay to Argentina page.